Eight years ago, Vanessa Amorosi made a significant career decision. She was still a major live drawcard and her album Hazardous had debuted at #7 on the ARIA Albums Chart and gone Platinum. But she packed everything and moved to Los Angeles to find inspiration. After 12 years in the spotlight spinning multi-platinum hit after hit in Australia and through Europe, she felt stale. “By the time I finished touring in 2011, I wasn’t writing good songs any more,” she admits. There was another reason. She’d been in the public eye since 13 or 14 – her first record was released when she was still at school – and she needed to work on some issues that came from growing up in public. Craving isolation, the ardent animal activist found a property outside the city, and surrounded herself with horses, dogs and parrots. Musically she found herself in new places. These ranged from writing country songs with Tony Joe White to singing in churches in some of the roughest areas of Los Angeles, and creating pop songs with a number of writers. “I was pretty much earning my stripes again,” she recalls. A game-changer was Dave Stewart of Eurythmics fame, who was knocked out by her voice when she guested at his semi-regular club night in LA’s Troubadour. They began writing, and he urged her to break the mould and take the sort of chances to make more timeless music. The two made an impressive record of gospel, blues and R&B which included her singing out front of a gospel choir in Memphis. A number of records were in fact made with different producers during that era, which will be released over time. In between this musical renaissance, she met mixed martial arts trainer Rod Busby in a café (“I was already late for a session, but I was even later as a result, we spoke for two hours”) and they got married in the Californian desert in the same tiny white church featured in Kill Bill. When she fell pregnant with Killian three years ago, she kept it very quiet. Even from Stewart; when he played some of their tracks to Mick Jagger, he immediately invited her to perform with The Rolling Stones on a North American tour. It was a jaw-dropping invite, of course, but one which she had to turn down. Fast forward to 2019, and Amorosi says, “Obviously in the last five years, all I’ve been doing has been behind-the-scenes, creating new art. “Now it’s about getting it out there. “I want to get back onstage. It’s an uncontrollable thirst. For most of 2019 Amorosi be working the Australian market, with hard touring, and possibly looking at Europe next year. As reported by TMN, she has new management (Sound Management Australia’s Steve Scanlon) and record label AngelWorks Productions run by Jennifer Fontaine and distributed by Universal Music Australia, and to which close friend and collaborator Jon Stevens is signed. Even the new single ‘Heavy Lies The Head’, made with her previous collaborators Aleena Gibson and Trevor Muzzy, was a last minute decision. “I had three other songs I was going to choose from. In the end I went for something which had nothing to do with those songs. “I spoke to Jon, can I get away with releasing ‘Heavy’ seeing that it’s not accessorised and pretty raw and I haven’t rewritten it a million times. Amorosi’s relationship with Stevens goes back decades: the musicians whom she played with in her teens are now part of his band. She always regarded him as one of the great voices. But her admiration grew after they penned songs for Stevens’ solo album. What does she attribute to her own voice sounding deeper on her recent material? Does she have any strange rituals to do with her voice? “I clean microphones before I use them, they are the germiest things ever! 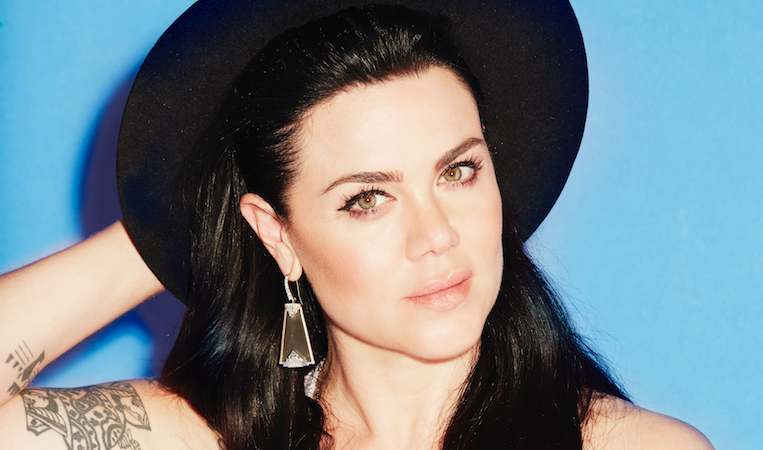 Vanessa Amorosi has announced a comeback tour. She plays 16 shows during April and May 2019, including the Red Hot Summer tour, three shows with Jon Stevens and six full band solo dates. Tickets are on sale now.